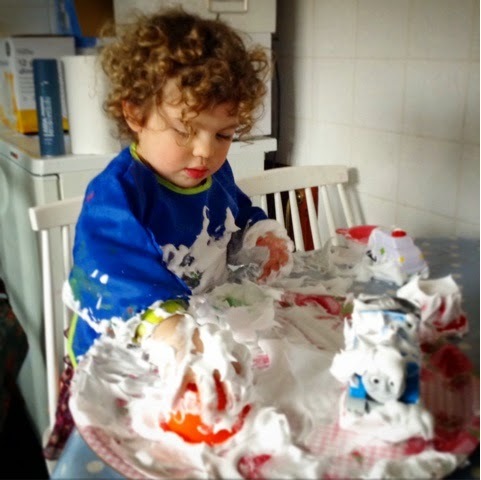 Ok so after years of parenting I have to admit that I find messy play scary, it stresses me out the mess afterwards then I do not do it for a while as I feel so stressed. So I thought it was time to get over those silly little fears and enjoy some playing with my toddlers and Asti when he wants to get involved. This week I have started small, we had to wait for son son to have a sleep as he does not like foam and shakes at the sight of it. I had brought a can of cheap shaving foam in the shopping and got together a few little toys that I knew Ami would enjoy playing with. The fun bit was spraying it onto the little tray I actually felt like a big kid. Then getting our hands in the foam and making it into little mountains. Ami said it looked like snow and that she liked to whoosh it around. She enjoyed putting the snow into little cups then clearing it away with the trains and cars. She made a robot and put lots of foam on its bottom, She was cracking up. The end result most had gone in the playing and the rest of the foam on the table and floor was easily cleaned. A perfect start for easing my way back into messy play. You're much braver than me! I only do messy play outside in old clothes. 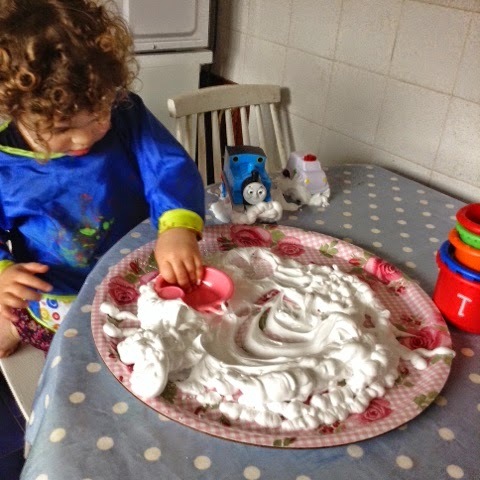 I'm a bit scared of messy play too but this looks like a great way to do it - easy to clean up!! Braver than me. Although the kids play with the shaving foam whilst there in the bath! I always avoided messy play too. I love shaving foam, even more than the girls I reckon! Dear Cbeebies Whats going on with Bing?